4 Bedroom Detached House For Sale in St. Austell for Offers in excess of £600,000. 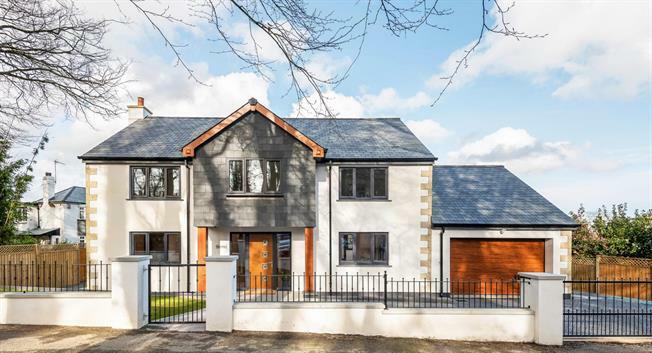 Located along a private drive close to Duporth Bay is this exceptional brand new four bedroom detached property finished to an immaculate standard throughout providing spacious, light and airy living accommodation on the ground floor and four generous double bedrooms and family bathroom on the first floor. The property is entered via a timber door leading to a spacious entrance hallway which is a wonderful entrance to this house. This area could be used for a multitude of uses from home office to dining hall. The main reception room is located to the left of the entrance hall and features a central fireplace with modern electric wall mounted fire inset to a porcelin tiled chimney breast. At the far end of the reception room are french doors leading to the rear decked area and gardens. The kitchen / breakfast room is a wonderful home with the kitchen itself being fitted with a bespoke painted hardwood base and wall mounted units with oak work surfaces. All modern appliances have been catered for including a double oven, induction hob, integrated dishwasher and free standing American fridge and freezer. Beyond the kitchen is the garden room which has a vaulted ceiling with Velux windows which flood the room with ample natural light. French doors lead to the rear gardens and decked area. Completing the accommodation on the ground floor is a utility room which provides space for a washing machine and tumble dryer together with a separate wet room and rear hall which also provides access to the attached double garage. At first floor level there are four double bedrooms and a famuily bathroom. The master bedroom provides en suite shower room facilities whilst the family bathroom provides a double shower cubicle and large free standing bath. Externally there is generous driveway parking to the front of the property accessed via an electric metal sliding gate allowing parking for up to three cars. Directly in front of the driveway is the attached double garage which has an electric up and over door, power and lighting. The rear garden is enclosed at all sides and features a raised decked area with inset lights and steps from this area lead down to the lawned gardens. All in all this fantastic brand new home needs to be viewed internally to fully appreciate not only the size and proportions of the rooms but also the quality of the finishing and attention to detail throughout. Situated on the south Cornish coast the property has access down to a security gated beach at Duporth with the South West Coastal Footpath providing onward access in both directions to further lovely beaches at Porthpean and Charlestown. Porthpean has an active sailing club and Charlestown is a picturesque port, often used in films and advertisements. Renowned for its lovely mix of individual shops, several wine bars, inns and restaurants and Charlestown is also the home of several tall ships which can often be seen sailing through the waters of St Austell Bay and again are often used as film sets etc. The nearest town of St Austell is within a mile providing a wide array of leisure, commercial and retail facilities, out of town trading estates and supermarkets, a variety of sports club and a large leisure centre together with a mainline station that provides a direct link to London Paddington with approximate travel time of 4½ hours. The road network from St Austell is excellent out to both the A38 and A30, both of which are largely dual carriageway all the way to Exeter where they link with the national motorway network. Other nearby attractions include the Eden Project and the Lost Gardens of Heligan and there are excellent golf courses nearby at Carlyon Bay which is a superb coastal 18- hole golf course with further golf courses at Polgooth just around the corner at Duporth. The following services are available; mains electricity, water and drainage. Heating via air source boiler providing under floor heating on the ground floor and radiators on the first floor. Telephone line and broadband however we have not verified connection. From St Austell bypass from the Truro direction, heading towards Liskeard, go past Asda up to the next traffic lights and turn right on to Porthpean Road, follow Porthpean Road up to the first crossroads at Duporth. Turn left and then immediately right into the entrance of The Drive (between the large gate posts). Duporth House is the located towards the end of this no through road and indicated by a Country & Waterside Prestige for sale board.